What do you think of my new Docs? It was actually hard choosing between the pastel pink, purple and mint green, but the mint is the most unique looking in relation to the rest of my wardrobe ∩(︶▽︶)∩ and I love the combination of black + pastel green. 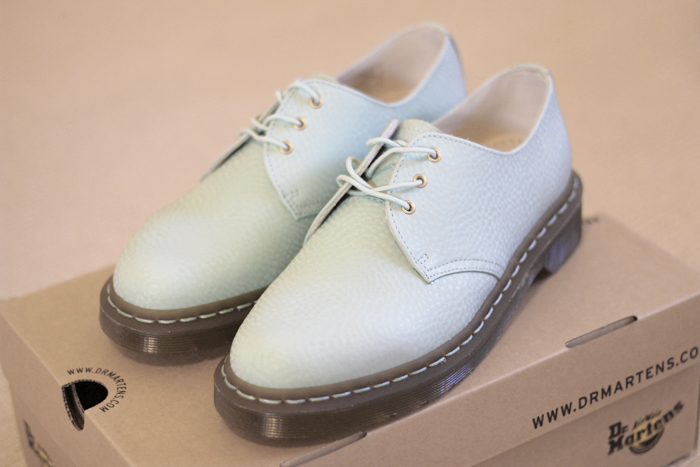 I love those docs but then again, I love anything if it's in mint green. I love them! great choice! and the socks you have on look great with them as well. Aw such cute docs. Aah, I remember my docs, I sold them though because I felt too short wearing them. These look so good! * U* I've been wanting to get a pair, but the pair I wanted ran out in my size when I was transferring money into my account, and I havent been able to find them again since. TOO GOOD. i need these. I love these, I'm ordering these for myself actually, I was just wondering if the shoe bends in the middle when you walk, like do you get a crease? I hope that makes sense! Also do they make your feet look big? They look so cute! I really want them, but my wallet is doing anything good for me. Wow! They are amazing where did you order them from ?